Nothing simpler: hit the web, visit a theatre breaks site and quote your credit card! Well however simple the web guys like to think they have made it – that is not always the case. Having just switched booking engines here at theatre breaks, for the first time for a long time I have realised what it is like to be a newbie! So after some frustration and not a little practise I now know what to do, how to get to the results I want and get the theatre break I am after! So I thought I would share my experience to make everyone else’s life a little more easy! First start off at www.theatrebreaks.co.uk – it’s as good as any, and better than some! If you know what show you want, go straight to the Book Your Break drop down menu to the right of this screen. Shows with “The” at the start come under “T” – The Lion King, The Phantom of the Opera etc. Let the page load and you are presented with a calander of when that show is available. You can go via the show page first (there is a list of the most popular on the front page) if you need more information (performance times etc) – then hit the red Book Now box and you will be presented with the same handy calander. Alternatively you can use the Book Now button on the header and you will go to a more generic page from where to start. The next bit is fairly straight forward – select the date you are interested in (that is the performance date and not necessarily your arrival date if you are staying for more than one night) and click on the “select and continue”. Next, if there is a choice, you will be presented with a variety of theatre ticket options. The descriptions are fairly straight forward (and there is a handy guide below the buttons if you need more help), but the tickets you need to look out for are Saver Tickets which will have a discount on them! Generally you won’t find these on a Saturday night and with the bigger newer shows maybe not at all but they are worth keeping an eye on as they can represent quite a saving. In general they will be available Monday to Thursday and some Friday evenings and Saturday matinees. If the tickets are top price then there will be no discount – sorry! Select the ticket now and we can start thinking about the hotel. Enter the check-in date (it will default to the show’s performance date) and the number of nights you want – again it will have defaulted to one night. Select the number of rooms and who will be in them – make sure the total number of people in the rooms matches the number of tickets you have asked for – and hit the button! Before you go any further have a look at the left hand column. Here you can filter out what you don’t want to see and also search for hotels with additional facilities. Use the sliders and the tick boxes. They will reduce the list to a much more manageable size. WARNING: If the list is quite long (over 100 say) give the site the chance to do each command. If you just want 4 star hotels don’t untick the 2, 3 and 5 star hotels all at once. Less than 100 and it should deal with your requests quite easily and quickly. 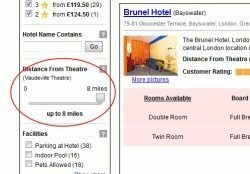 There is also a little slider that will filter out hotels by distance from the theatre. This is great if you have to be within walking distance but quite often it is just as quick to travel 4 miles in London as it is to travel 1 mile if the Underground network is with you. There is a little work to be done here… the nearest tube stations are listed for the hotel but not what line the tube station is on and the tube station for the theatre is not mentioned at all. There is a google map but that doesn’t show tube lines. I suggest working out how far you are prepared to walk (and in London it is a true joy to walk if you are not in a hurry!) setting the slider at that and then if there is nothing that matches your requirements open the slider out to about 4 miles. You will get a good selection and some good deals. That is not to say that there are some great hotels outside of 4 miles… it is just that if you are in London for one night you don’t want to spend all your time travelling and if you are within 4 miles of your theatre that also meals that you are within 4 miles of almost everything else you will want to do in London! Lastly look out for the Mystery Hotels – normally 3 and 4 star hotels who are happy to give you an excellent deal as long as it is not publicised generally which hotels they are! After you’ve got your hotel, select your rooms types and off you go to the summary page. Here you can add the other bits and bobs that make a theatre break special – and easy! Rail travel, just select your local station and the class you would like to travel, confirm the dates and get a price – you can add it or not – your choice! You can add travel insurance – very useful this as you are not able to cancel a theatre break – and you can add the fun stuff – London passes, Legoland, London Eye, Kew, Wimbledon Tour, An Olympic guided walk… go mad, you may have to go back and add an extra night! And that is it – you just have to pay! Of course if you are online between 8am and 11pm and it is all getting a bit too much then just call them up. You can either talk through the booking online or start again because however simple the web guys think they have made it, there is always an opportunity for us humans to get confused!